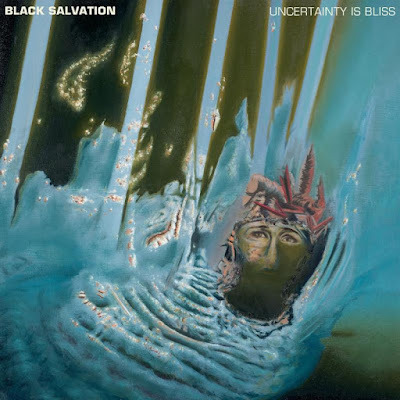 "Uncertainty Is Bliss," the debut full-length from German psychedelic, hard rock trio, BLACK SALVATION, is out now via Relapse Records. Stream the record in full at smarturl.it/BlackSalvationUIB where you can also view the band's video for "Breathing Hands." BLACK SALVATION - featuring Uno Bruniusson formerly of In Solitude and Grave Pleasures and currently of Death Alley - challenges the listener to open wide the doors of perception and slowly drift away amongst their transcendental compositions and deeply hypnotic tales of magic and mysticism. Across eight tracks and over forty minutes, BLACK SALVATION exquisitely blends hard rock, doom, and psychedelia into an intoxicating synthesis of rock 'n' roll alchemy. "Uncertainty Is Bliss" is surely one of the most captivating rock debuts in years. Uncertainty Is Bliss is available on CD, LP, and digital formats. Physical packages are available via Relapse.com HERE. The digital edition can be purchased at smarturl.it/BlackSalvationUIB. BLACK SALVATION is currently in the midst of a short European headlining tour. See all confirmed dates below. Exploding into a thousand shards of awesome at the unlikely nexus of heavy metal, post-punk, protest rock, krautrock, and traditional rhythm and blues, BLACK SALVATION is obviously not playing by conventional rules. Not in the way they approach their unique brand of psychedelic hard rock. Not in the DIY way they recorded new album, Uncertainty Is Bliss. And certainly not as composers and actors in the Max-Ophüls-Preis-nominated short-film Wald. While safe thinkers covet and cradle known tenets,BLACK SALVATION are blasting fantastic between unknown of inner and outer worlds of rockdom. Formed in Leipzig in 2009 by Paul Schlesier, BLACK SALVATION's early years pivoted on jamming gritty dirges, à la Electric Wizard, and elongated, repetition-based space-outs. Over the next few years, the Germans, with bassist Birger Schwidop and drummer Christian Seitz in tow, honed their craft and assisted in the foundation of Into Endless Chaos (IEC), a DIY organization of Leipzig-based counter-culture musicians and artists. Confident in their heavy wander and galvanized by their IEC interactions,BLACK SALVATION released their debut album, In Deep Circles, without label support in 2014. Praised equally for its riff-based rockers ("Reveal The Night" and "Black Spell") and lava lamp runs ("Silent Magic Spring" and "The Devil Sent Us An Angel"), In Deep Circles illustrated BLACK SALVATION were crafty, adventurous songwriters with designs on rocking stranger things the hard way. With Bruniusson behind the kit and the vibes at eleven, BLACK SALVATION wasted little time - a week, basically - before entering an unnamed rehearsal room (not a studio proper) to track Uncertainty Is Bliss. They had as long as they needed, but environmentally it wasn't the best place to record a trans-genre, beyond-space masterpiece. For eight days, BLACK SALVATION fought the confines of the rehearsal room. But between high-end mics and a vintage, if temperamental eight-track Fostex tape machine, they emerged with a modern-day gem of psychedelic hard rock madness. The songs were eventually transferred to computer, where the finishing touches - overdubs and vocals - were constructed for mixing and mastering aces Martin "Konie" Ehrencrona (Tribulation, In Solitude) and Pieter Kloos (Sunn O))), The Devil's Blood). BLACK SALVATION's Uncertainty Is Bliss is to today what The Stooges' eponymous debut was to 1969. It's what Led Zeppelin IV was to Fast Times At Ridgemont High. And it's how Can's Tago Magocontinues to blaze minds after nearly fifty years on wax. Songs like "Getting Slowly Lost," "Breathing Hands," "Grey River," and the short but filmic instrumental "The Eye That Breathes" - as well as the other four previously named songs - transcend today and yesterday. They're tumultuous, pensive, rebellious, noisy, and perfectly imprecise hard rock tunes for otherworldly enjoyment. So, the adage isn't true. Bands do make hard rock like they used to. BLACK SALVATION's Uncertainty Is Bliss is psychedelic hard rock for all.